Clibing hempvine, photographed at Tall Cypress Natural Area, Coral Springs, Broward County, in March 2014. Climbing hempvine, Mikania scandens, is kind of a mixed bag, depending on where it's found. It is a Florida native, found throughout the state. In parts of its range, it's a protected species; in others, it's considered a serious pest. As we said, a mixed bag. It's a low-growing vine found in wet areas along the edges of forests and hammocks, along stream banks and swamps. Its native range extends as far north as Ontario province in Canada, where it is an introduced plant, to the eastern United States, the Bahamas and Cuba, Mexico, Central America and South America. 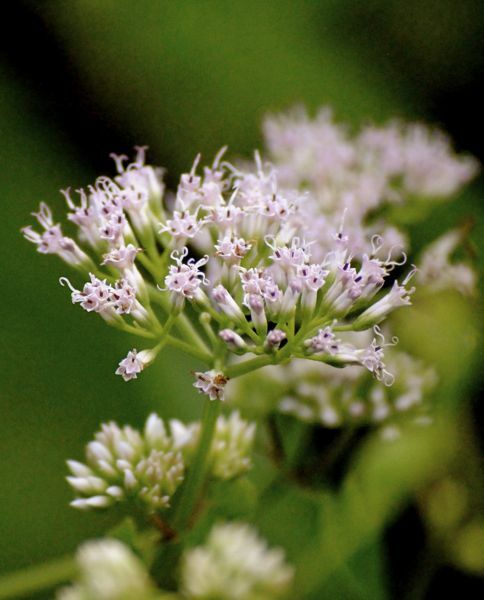 Climbing hempvine is considered endangered in Indiana and threatened in New Hampshire. Hawaii considers it a noxious weed. Climbing hempvine produces clusters of pinkish white tubular flowers all year. Its leaves are sharply triangular, with a deep notch where the stem meets the leaf. Think of an arrow. It is a perennial and flowers year round. It clambers onto its neighbors and uses them as support, in some cases overgrowing and out competing them. It has a reputation as invasive scourage worldwide, but the Invasive Species Compendium says this might be due to the plant's evil "twin" rather misbehavior on its part. 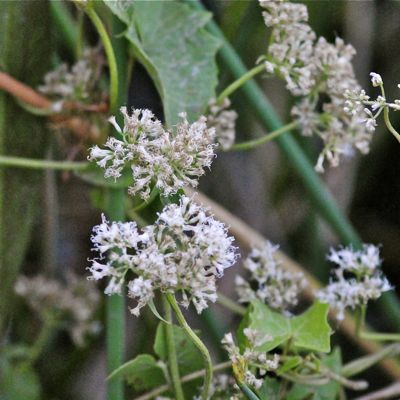 The Mikania genus has 300 members; two others besides climbing hempvine are found in Florida — native Florida Keys hempvine and an invasive called mile-a-minute, or to scientists, Mikania micranthia. It doesn't take much imagination to figure out what the problem might be with the latter. However, the three species are difficult to distinguish, except when they flower, and by that time, it might be too late to remove it if the plant growing on your property is the evil one. M. micranthia is a massive seed producer, and listed among the world's worst weeds. According to the Compendium, our guy, climbing hempvine, is only found within its native range. Reports that it has been introduced, naturalized and become invasive in places like Africa, Southeast Asia and the Pacific might be due to misidentification and that the real villain is M. micranthia, mile-a-minute. The only place where the two plants are believed to overlap is Florida. Climbing hempvine is widely used in folk medicine around the world and scientific studies have confirmed that it has beneficial compounds, including antioxidants, anti-inflammatories, analgesics (pain relieving) and antimicrobials. The Compendium, however, said the scientists conducting the studies might have misidentified the plant with M. micranthia. The Seminoles used climbing hempvine to make a treatment for itchy skin. Delray Beach's Institute for Regional Conservation says climbing hempvine is used in landscaping, mostly in restorations, natural landscapes and butterfly gardens. It's been an important plant in Everglades restoration efforts. Climbing hempvine is a host for the little metalmark butterfly and a source of nectar for the same. The leaves, high in nutrients, are fodder for grazing animals. Climbing hempvine is also known as climbing hempweed. It is a member of Asteraceae, the aster family.